I use two monitors on my PC at home, three on my PC at work but frequently I still run out of room on my desktop to view all the applications that I’m currently running. That’s where virtual desktops come into play. Virtual desktops have been common in the Unix and Linux world for a long time, Apple introduced them by default in Mac OS X 10.5 in late 2007, but Windows still doesn’t come with a virtual desktop application as standard. Microsoft acquired Systernals in 2006. 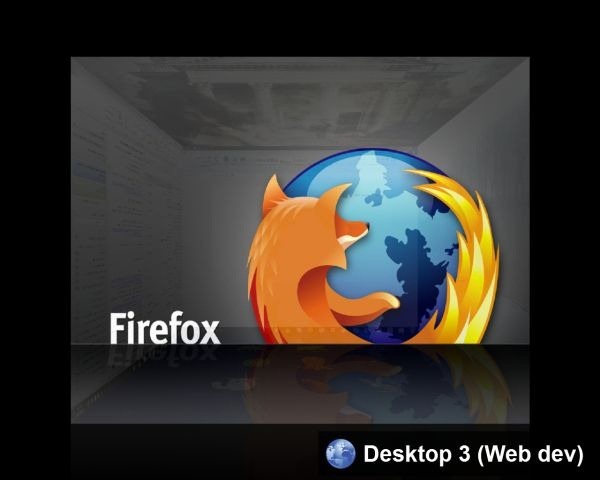 They launched Desktops in 2006 which allows you to organise your applications on four virtual desktops. Aero theme, Flip 3D and many notification icons only work on desktop 1. You can’t move applications from one desktop to another. You must have the same wallpaper on each desktop. You cannot close Desktops, you need to either log off or reboot. 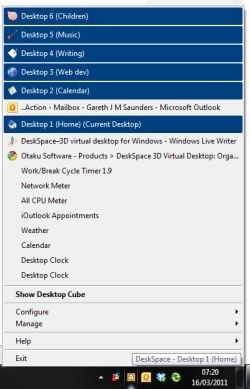 After checking out various virtual desktop applications, including the freeware VirtuaWin, I settled on DeskSpace from Australian software company Otaku Software, which costs US$24.95 (currently around £15.50). Maximum of 6 desktops, on up to 9 monitors. Switch between desktops with a stunning animated 3D cube (which you can customize the speed and size of). Customize hotkeys to switch between desktops, or use your mouse wheel. Customizable wallpaper on each desktop. Rename and assign a different icon to each desktop. Drag applications from one desktop to another. Assign certain applications to open on a particular desktop, e.g. Outlook always opens on Desktop 2. When you right-click the icon in the notification area you can see what applications are currently open on which desktop. A really nice feature is the ability to drag applications from one desktop to another on that list. One niggle for me is that the options are split between two menu items—Configure and Manage—as I keep forgetting which configuration option is where; it would be nice to have all the options in one unified location. I would also have liked to have seen some of the options combined such as customizing the wallpaper, names and icons for each desktop together on the same screen. But these are minor points, as it doesn’t take long to set things up the way you want them and then just leave it. One superb feature is that the software license is for individual-use which means that you can buy one copy and install it on as many machines as you use, for example a desktop and laptop. Given that my laptop (as most do) has only one screen this has become an invaluable tool. DeskSpace has been a really welcome addition to my workflow, particularly at work where I can assign separate desktops for dealing with support calls, FTP, graphics manipulation, etc. It supports both the 32-bit and 64-bit versions of Windows XP, Windows Vista and Windows 7 on low-end netbooks, high-end desktops and everything in-between. 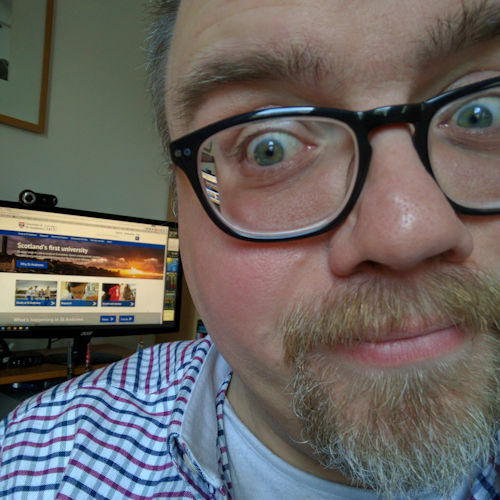 Why not download the trial version of DeskSpace today and give it a go? A couple of weeks ago I decided to upgrade my photo editing application to the latest version: Corel PaintShop Photo Pro X3. However, I ran into a fairly fundamental problem: I couldn’t get it to activate. It was a couple of days before I went to Glen ’10 (the Scottish Episcopal Church’s summer youth camp) when I realised that I didn’t have a photo editing package on my laptop (which I’d be using to produce the daily newspaper at Glen) and being a good boy and not wanting to violate the license terms by installing my old copy on more than one PC I decided to upgrade and obtain a shiny new license for my laptop. Corel offer two “delivery methods” for PaintShop Photo Pro X3: download or DVD. I needed it fast so rather than waiting for a disc to arrive in the post I selected the download option. But that’s where the troubles began! PaintShop Photo Pro X3 activation window … hmm, something is wrong here. Erm … ok. I had a blank dialog window and nothing that I did would get me past that. I then wasted a couple of hours fruitlessly surfing the Web looking for a solution. But nothing I tried would activate it. I quickly got on to Corel Support, initially demanding my money but their customer support was so good, and I eventually calmed down about it (! ), that I gratefully accepted their help. Even though this was now the week after Glen ’10 had finished! This was now the week after the week that I actually needed the program! I got a call from a support advisor who walked me through the activate by phone option. A couple of days later I received a DVD in the post. 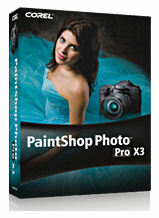 Using the DVD Corel PaintShop Photo Pro X3 installed in minutes with no online activation required. I need to plan further ahead when preparing for Glen ’11 and check that I have all the software I need on my laptop, and not just do two nights before I leave! Don’t send support calls when you are really tired and grumpy from failing to activate your new software for a couple of hours. Go to bed, sleep on it, then contact them. Don’t select the download delivery method the next time! Almost every time I’ve selected the Corel download method I’ve ran into problems, not just with PaintShop Pro (as it was then) but with other Corel applications too. From now on I’ll go for DVD only.